While I was sorting a bookshelf a couple of nights ago, I came across a red notebook that had been my grandma’s. 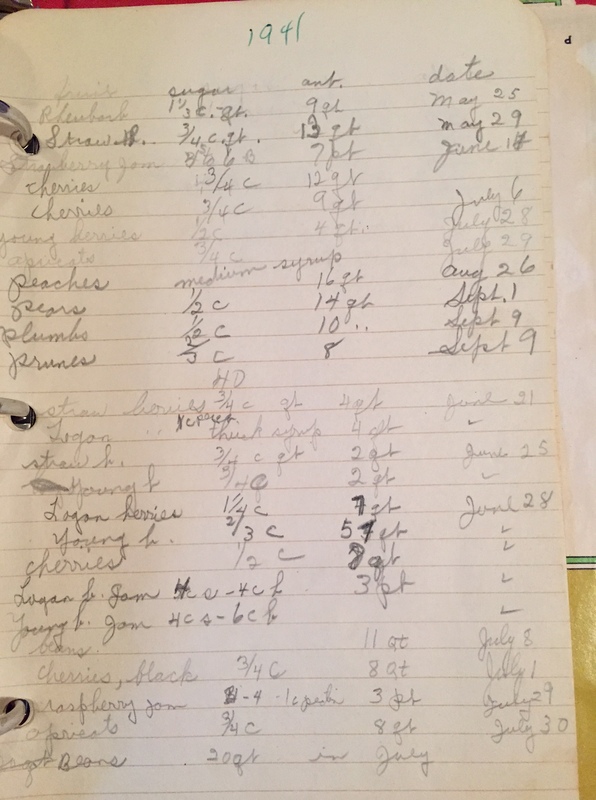 I got completely distracted as I started reading it, and realized it contained recipes, housekeeping tips, and all of her canning records. There was a page for each year, starting in 1940 and continuing until 1990. I had so much fun reading over how many quarts of this and that she canned and froze. I only noticed a few years when they butchered pigs, but saw quite a few entries for canned fish. I’m pretty sure they butchered chickens at times, but I didn’t see entries for that. I noticed that at the beginning, she wrote of taking her frozen foods to a locker. Then, after a few years, those entries stopped, somewhere in the 60’s. I’m sure that’s when she got her freezer. I still have and use her upright freezer. I don’t know if it was her first and only one, or if she replaced it somewhere along the line, but I know it’s very old. It was very fun and informative to read over some of the old housekeeping tips, such as how to set a table properly for breakfast, and other such ideas. I won’t be getting rid of the old notebook. I anticipate reading the whole thing one of these days when I have more time. What a cool book to find! Perhaps your grandmother didn’t can chicken because they only butchered them as needed? It’s a thought anyways. I’m glad you are going to keep it…such a precious heirloom to hold on to!! I have such nice memories of my grandma, and this made me feel close to her even though she is in Heaven now. I should ask my Mom about the chickens–she might remember. Becky, that was such a nice find! I remember up until I was about 6 my grandparents still used a locker. Then they got the chest freezer. I should ask around my cousins and see if anyone still has it. I suppose they just wear out after awhile or become too inefficient. Knowing my family though it is still somewhere being used for some purpose if possible. I’m still using a few really old “family” freezers, but sometimes have wondered whether or not they were efficient anymore or not. Anyway, they keep the food frozen:) I have had that little notebook for quite a while, but I guess this is the first time I really read it and realized what it was. I’m glad I took the time. That is a treasure. We inherited my husband’s parent’s ole Philco freezer. It worked great, but boy it sure ran all the time. Saved a lot of electricity when we got rid of it. I’m hoping to reduce our huge electric bill when I get one or more of these old freezers unloaded.